PropertyPages is the only site that has a Fair Listing Policy and Listing Guarantees. We do not cater to Real-estate Agents only or prioritize agent listings over private listings. With our Fair Listing Policy, we make sure that every ad will receive its fair share in the spot-light. Our unique listing guarantee will further extend the run-time of your ad if certain viewing goals are not achieved. Featured ad credits are part of the packages and do not expire after a few days or a certain number of views; they are valid for the whole duration of the subscription. To maximize your ad exposure, featured ads are also posted on our Facebook and Twitter pages as well as on our partner sites such as MalaysiaPropertyBuzz.my. List your property on PropertyPages for Free. Comprehensive listing packages starting from as little as RM 5.00/month per listing. Total number of Active property listings on PropertyPages. Listings must be confirmed every 14 days. Unconfirmed listings also listed as featured will lose the featured status. Listings not confirmed within 30 days may be listed with lower priority and after 60 days will be deactivated on PropertyPages. Deactivated listings can be re-listed on PropertyPages and promoted to "Featured" once the listing has been confirmed. Total number of listing ads that can be created under the subscription. Premium packages may create multiple listings and periodically rotate the ads or replace a sold / rented property with a new ad. *2 Any account is limited to a total 10 Free ads creations. Total number of listings that can be listed as featured at the same time. Unlike other property portals, "Featured" on PropertyPages is not based on a number of featured views or days. It is for the whole listing period. Owners are free to switch between listings any time. Featured ads will also be posted on PropertyPages' Facebook and Twitter pages. 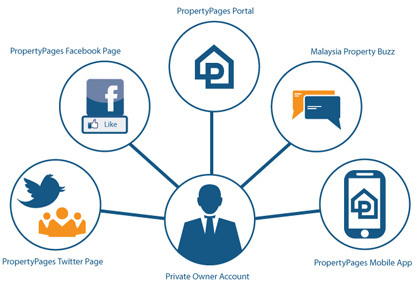 As an add-on service the property can also be listed on partner sites, such as MalaysiaPropertyBuzz.my. Free listings will receive the lowest priority. To increase the visibility it is recommended to subscribe to the PartnerSite option which will display the ad on multiple websites. Property enquiries are forwarded immediately to the advertisers. Detailed viewing stats for each property will be provided in near real-time. Viewing stats do also provide geo-location information. *3 Only basic viewing statistics available for free listings. Contact information of enquiries from PropertyPages can be added to a contact manager which can also be exported as vCards or QRCodes. Stats of property enquires are collected and made available to the advertiser. Through the PropertyPages mobile app advertisers will receive instant push notifications of incoming inquiries. Advertisers can schedule Open House events which will be displayed on PropertyPages in nearby searches. Website Visitors can easily contact Advertisers that are close to their locations to arrange a property viewing. SmartRealtor includes an event scheduler to manage property viewings, open house or general events. Enquiries such as viewing requests from PropertyPages can easily be added to the event scheduler to manage your property viewing schedule. SmartRealtor provides manuals, tutorials and webcasts to help with all aspects of creating and managing property listings. During business hours chat support will be provided to paid subscribers. For paid subscribers email support will be provided for general enquiries.